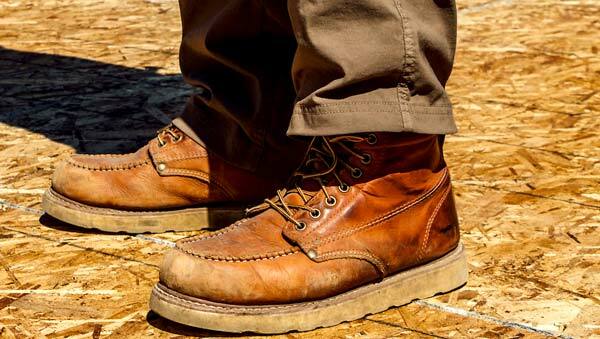 Logger Boots vs Work Boots: What is the Difference? 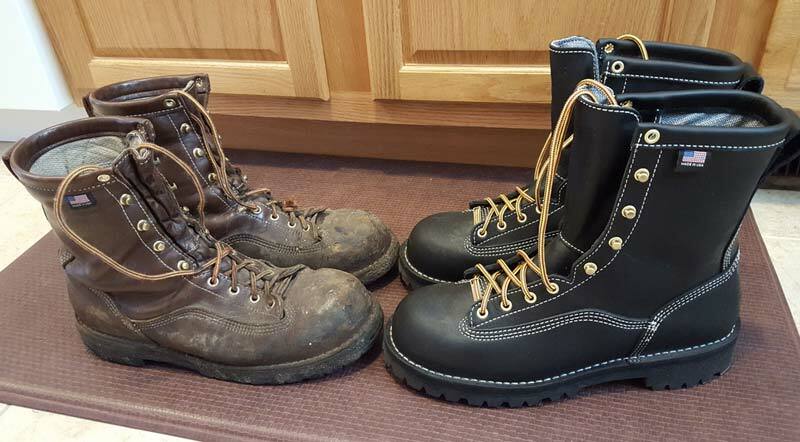 When it comes to working in construction and in the logging industry, the difference is boots will vary quite some bit and while one boot is used for logging, it will not always be the best option for those working in construction. Construction boots are designed to endure significant punishment, while the reason for logger boots are to keep your feet safe and comfortable. We have decided to do a little digging to find out all the differences of these boots, so you could understand which ones are needed and which boots are the best for your specific profession. Thanks to a few brands and suppliers, we managed to test out a couple of these boots and find all the differences between them. When it comes to logger boots, there are a few significant differences to some of the other boots. While they are made from the same quality materials as most of your construction boots, they have a couple of additional features for the logger and to not only keep their feet safe but to promote the most in terms of comfort as well. The waterproof feature is one of the main features that you will have as a logger and when it comes to working in the wet areas of the bush, you need to keep the water out. The swamps can be i9nfested with bacteria and dangerous creatures in the water, which means that having a waterproof boot will keep all of this out as well. Logging boots are generally much bigger than your standard boots and once again, this is to keep anything from crawling into your boots while you are on the job. Having a poisonous spider or scorpion in your boots can not only be frustrating, but it can also be fatal and this is why the 8-inch boot is the best option for protection. 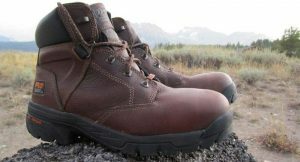 Another important aspect that you will find in most logging boots is the breathability and they might lack some ventilation, but with Gore-Tex being one of the main inner linings found in boots, it can certainly keep your feet dry and wick away most of the moisture that is generally considered a problem from sweat. The final important aspect will be the outer soles and with slippery conditions being a prime cause for fatal injuries, the outer soles are made from lug rubber and they have unique patterns. This promotes grip and will ensure that you will not slip, it also enables you to trek in the worst of conditions without having to worry about injury. 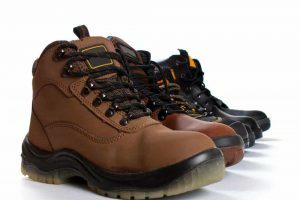 Work boots are a little different and this means that you will have more safety features that will keep you protected. These boots are mostly made from prime leather materials and the leather is used to promote excellent durability in the boots. Since water is not much of an issue, the boots are not really designed for trekking through wet conditions and are mostly water resistant. While work boots might vary depending on your job, they all have one common goal in mind and this is to reduce the amount of fatigue and to keep you safe. Most work boots have protective toes to ensure that you do stay safe and you will need to choose between the heavy steel toe or the more expensive composite toe when purchasing a boot. The shanks are another major factor to look into and with so many different options; it can be hard to find the right one. Most commonly, you will find the steel shank and this offers excellent protection, but it is rather heavy as well. The nylon shank might not offer the same amount of support, but due to the lighter weight, it certainly reduces the amount of fatigue that you need to endure. One of the common denominators between these boots are the outer sole and they are not as much primed for keeping you from slipping as they are for providing you with excellent comfort. The outer sole of most top quality work boots will be fitted with shock absorption technology and this will certainly aid in reducing fatigue in your feet as well. You should also keep in mind that work boots are designed for different purposes and if you work in the corporate sector, style is another important thing to keep in mind. Id the boots are not stylish, you might not make the best impression on your boss or your new clients. When choosing new boots, you should certainly keep the style factor in mind and look to see if the boot does fit your new wardrobe. What Are The Main Differences That You Will See? 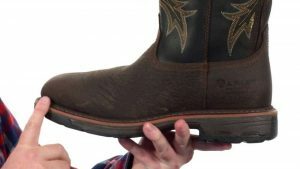 With all this information, you might still not know what the main differences are between these boots and you might confuse them with one another in the store or when shopping online for a new pair of boots. We have decided to make it simple and you could not easily see some of the differences that they have. Waterproof: Logger boots are designed to be waterproof, while the work boots are mostly water resistant when it comes to the design. While logging you will need to deal with water much more often. Electric resistant: Electrical hazards are not really a common thing in nature and logger need not really deal with the prospect of facing these hazards. They are not included in your logging boots, while work boots might have them included from time to time. However, this is an expensive addition. Length: Logging boots are much tall as we have mentioned and the reason for this is to keep things from entering the boot and causing you some frustration while you are working. Work boots can vary depending on the job. Moisture Wicking: Lastly, is the moisture wicking and with better inner linings, the logging boots will have better moisture wicking to offer you. On the other hand, the work boots have much better ventilation to keep the boots breathable. Can I Use Logging Boots For Construction Work? While it is not generally recommended, it can be done. Unfortunately, the logging boots will lack some of the protective features you need in the construction industry, but if you really need to interchange the boots, they can be used for construction as well. Unfortunately, it will not work to use your construction boots for logging and with so much water to contend with, the boots might wear out much faster and this will be really problematic. It also has a couple of fatal flaws and safety risks that need to be dealt with to ensure that the boots are safe for taking on nature. Now that you have a better understanding of the main differences between these boots, you should be able to find them with much more ease as well. 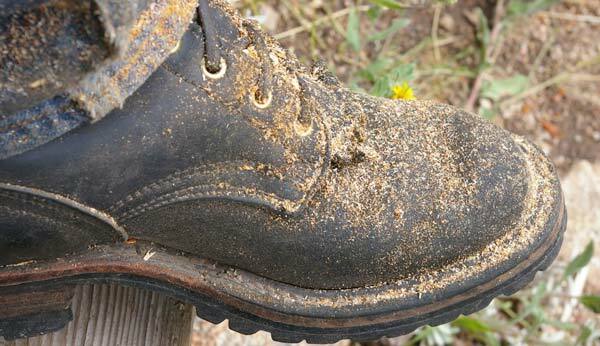 Logging and work boots are highly recommended for their specific purposes and manufacturers do spend a lot of time to ensure that you do get the best possible quality and value for your money. We would like to thank you for reading this article and we would like you to share your thoughts on these differences of these boots. Be sure to let us know in the comment section what your thoughts on them are.